Emmy® Award winning Top Prospect Video Productions, LLC is “Professional College Recruitment Videos for the Serious High School Athlete.” We are a fully insured video production company for the Phoenix, AZ region. We specialize in professional but affordable college sports recruitment skills videos for athletes in their high school years hoping to garner a scholarship from a college, university, or junior college with emphasis on academics as well as athletic ability. What sets Top Prospect Video Productions apart from most Arizona production companies is that we only specialize in college athletic recruitment videos. We have the experience, the knowledge, the equipment, and the passion to help elevate your child to the next level. We’ve done our research and know what college coaches want to see in a recruitment video. Top Prospect Video Productions uses only state-of-the-art High-Definition video equipment including Panasonic AG-AC30 and Panasonic AVCHD 70 professional cameras; Magnus and Pearstone professional tripods; Samson PF6 professional microphone; MacBook Pro Final Cut Pro X editing system and we provide courteous and professional service. We measure foot speed and videotape fielding drills for baseball and softball and record complete games for all other sports – exactly what college coaches are asking for. We also offer a sit down interview with your son or daughter and offer coaches’ interviews as well. We will do just about anything to help get your child noticed by a college coach. Top Prospect Video Productions Owner, Dale Wyman, has over 30 years experience with videographer and editing skills. 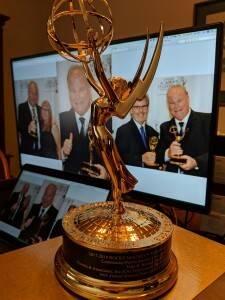 Wyman has garnered over 155 awards including two Emmy® Awards for his creative work as a producer and director. Wyman has also been very involved in baseball for nearly 10 years as a coach, statistician, Vice-President of the Vegas Rebel Baseball Club in Las Vegas, NV, and former Booster Club President for the Tolleson Union High School baseball team in Tolleson, AZ. Learn more about Dale by visiting our “About” section. Don’t just take our word for it, here is what satisfied customers are saying about Top Prospect Video Productions, LLC… To view more testimonials, click HERE. “As the President of a large, Midwest softball organization, I started exploring recruiting video companies for our players a while ago and I had no idea it would mean hundreds (yes, hundreds) of hours of research; from emailing college coaches for their input to watching recruited players’ videos, to pricing to studying what successful videos look like. And Top Prospect was it! Trust me when I say there is no one better. Their professionalism, hard work, creative vision, dedication to your player’s best look, take after take after take to get just the right shots – integrity and honor beyond words. I’ve never seen someone work so hard to get exactly what he was looking for – amazing job. “Top Prospect Video Productions is a no frills video production company. Nancy and Dale have a baseball background as well as extensive video production experience. The videos they produce are professional and relevant to what college coaches want to see. The 60-yd-dash is timed and videoed with the actual time inset in the video, no fudging times here.